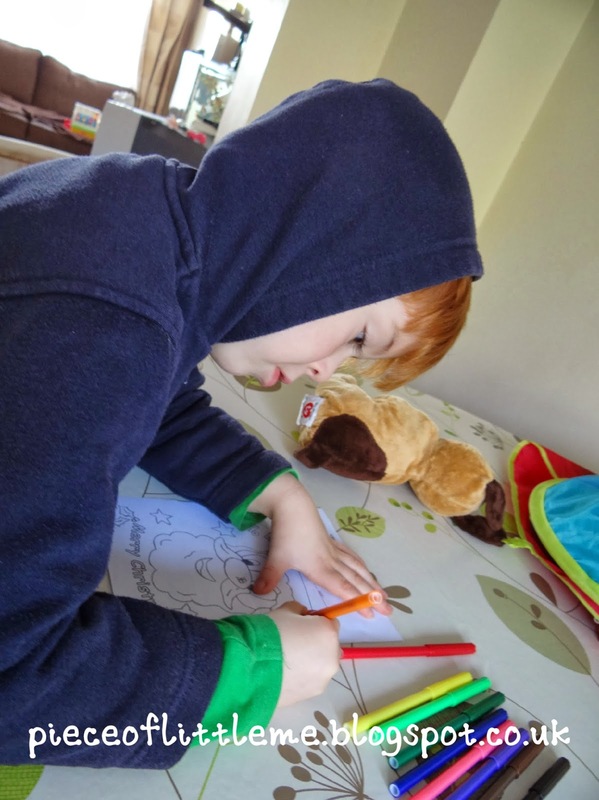 A year in the life of a stay at home mum...from school application to school for real! A really lovely week this week, packed jam full with Christmas preparations and get togethers. The kids are excited with all the extra goings on and amount of chocolate they're allowed to eat...usually only reserved for Fridays! The local toddler group had its usual play dough , painting, dolls, kitchen, train set, trikes, and this week, as the last few weeks, Christmas crafts have come out too :-) it's always lovely to do a new twist to a Christmas craft...this being my 6th Christmas with children! This week we did stars for the Christmas tree, but with baby Jesus in the middle on a bed of straw. I particularly love his little face and Florence's name written on the back! A lovely combination of letters and shapes. At this age she can get really involved in the craft rather than just sitting on my lap and having a bit of a dabble whilst I make the thing! I have become quite accomplished at craft these past few years (giggle giggle)! I've spent many hours trawling the net for the best ways to display the children's art work and come to the conclusion that I will photograph it all and put them together in a photo album one day. I'm sure as they get older their masterpieces will become less frequent so I really want to make the most of the ones they do now. This week too , my son Finley has been in his questioning mode. Post "class nativity" with the inevitable stage set mishaps, children crying and lines forgotten; how cute are they?! It has been, "how old are you when you go to heaven? ", "can you come back again? ", "what happens when you die in heaven?" , "are there play parks in heaven?" , right through to ..."do babies like stories? ", "how do you know which story they like if they cant talk? ", " Why are all mummies aged 21?!"... Don't you just love the enquiring mind of a 5 yr old?! My ambition sometimes is to home school, I would just love to home school, hubby is not so convinced! This week my daughter has been learning phonics, we've done "S, A, T, P, I, & N". I love how keen kids are to learn. She just wants to be like her big brother. For the first time we practised blending and so she read "Sat" , "Pat" and "In". ..one very chuffed little girl! Finley counted out loud up to 100 too this week. At 5 I thought this is pretty easy for him, but I've not actually heard him do it before, I don't think I have anyway! So maybe he's only just able to do it? who knows! ...I must right down their milestones more often! Final photo: Lantern parade. This week was the first time we've been to one. Mental note: try making some at home! Well, that's just some of my week. Are you a stay at home mum? If so I would love to hear from you and all your tips for making the most of your last year before school begins. Hello all, I have been so busy this last year I haven't had time to blog. However a few weeks ago I started a diary, and it occurred to me that it might be useful/interesting to others to publish it here! We applied for my youngest's school place last month, a big turning point for me in mother hood. How has it reached this stage so quickly? She is going to be our last child so I really want to make the most of my last year with her before she is swallowed into the whole school system, and I only see her evenings and weekends. I know school these days is fun and my son loves it, but I do miss my time with him! So I started a diary to keep all those special memories and photos and preserve all those funny little things they say at this age. I'll print it out and keep it in a folder for the children when they're bigger! As a stay at home mum ...who knows what next year will hold for me when both kids are at school full time? A new journey will unfold as the year passes I'm sure! Well, I cannot believe it has been 4 months since i lasted posted , eek, where has the time gone? Christmas has been and gone and now its almost Easter. ...I did get that sewing machine for Christmas, yippi, so I hope to be posting some of my sewing makes on here soon. I hope you are all well. I have had what seems like continual sinusitis...in fact I am wrapped up on the sofa with it again now! Never mind, I am enjoying Midsomer Murders on play back and planning my next knitting project! 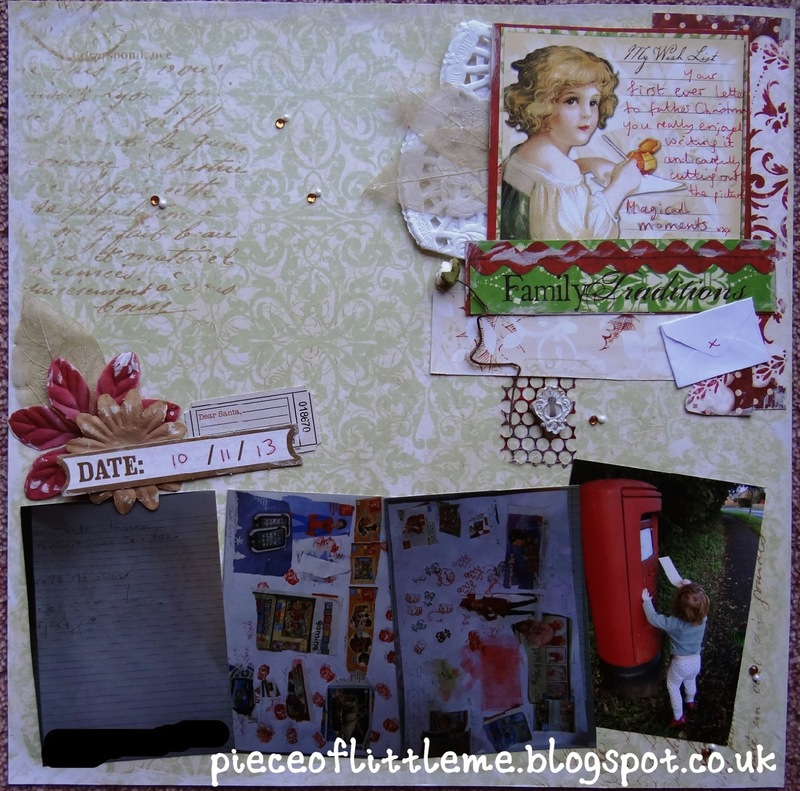 Anyway, I have been continuing some basic scrap booking . I put together an album for my Mum and Dad, of their recent trip caravanning around Spain. They started at Santander and went down to Cadiz then back up to Bilbao...meandering around on the way! They visited Caceres, Seville, Malaga, Cordoba, to name a few places! It took me quite a while to scrap the whole trip, as the trip was 7 weeks long, and many photos were taken! I included emails, maps, postcards, and a space at the back for leaflets and extra photos they particularly loved and wanted to include. I tried to keep the colour scheme and patterning coordinated through out the album, to show it was all of the same trip. bright and sunny!! My mum and dad had a fantastic time away, and it was the first of what hopes to be many travelling adventures for them. I wanted the album to celebrate their first trip. Well, at home we've been continuing our geocaching with the kids. Now that the weather is better and the storms seem long gone, we are able to get out more. I cannot imagine a child hood that is not spent mainly outdoors, so we are out as much as we can :-) . This picture was taken after our streak of 40 days caching in a row...it is very addictive. The kids love it! Out latest favourite finds include a cache in a fake snail shell, one in a bolt , and one in a piece of false grass! The hides always keep you on your toes these days, and the challenge of a treasure hunt never fails to excite the kids. 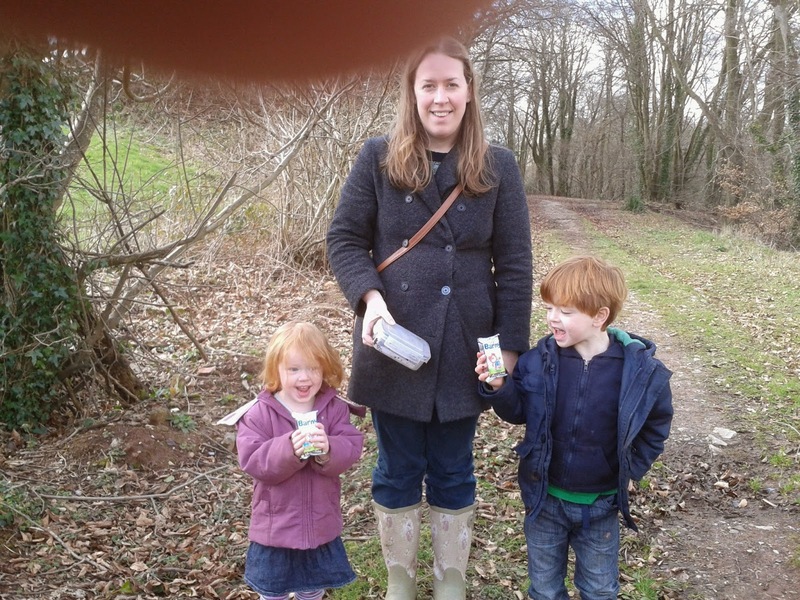 My daughters favourite cache so far was on a walk called "The Great Sausage Hunt"!, that we did during the holidays. See www.geocaching.com if you want to give it a go...its FREE!!! 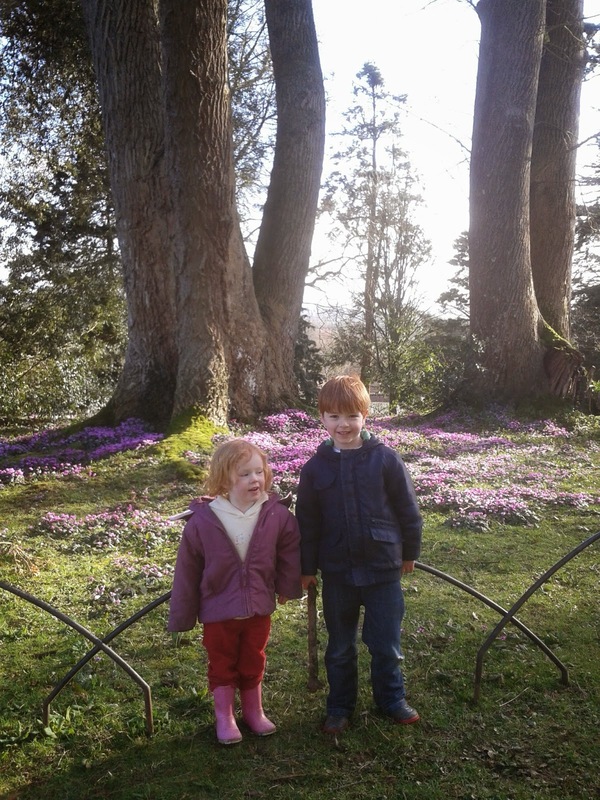 National Trust gardens also continue to amuse the kids too, with trails, letterbox hunts, teddy bears picnics and forest parks. We have never yet actually been inside a property, not had time! We are trying to continue the "50 things" challenge too... my son having completed 25 so far, and my daughter 15. This was some beautiful cyclamen in the half term hols in Devon. Well, after Easter we are off to the Scilly Isles! Yippi Yippi Yippi!. They look amazing, and we've always wanted to go... have any of you been there? The Gig racing, pancakes on the beach, sea, moorland, pony rides, island hopping, bronze age stone sites, bird hides...endless fun. We especially want to go to St. Agnes. That is my dream. A well deserved holiday to blow away the winter cobwebs. What hols have you planned for this year? This year I am trying to do a completely home made Christmas, have you ever tried that?! I've never tried it before but i thought it would be fun...plus it must save money...surely?! i've knitted some decorations and this week i've been baking....my Christmas pudding. I've never made our Christmas pudding before, but this year our local church was doing a Christmas pud making evening. It was great fun. All we had to take was a bowl, a spoon and a £5 note. It was easier than i thought. We even have the recipe to use again next year. Yesterday I steamed it for 8 hrs which was easier than i thought too...the only difficult thing will be to not eat it before Christmas!! hee hee! It smells delicious. Check out your local church/ scout group/W.I. /village group for a "stir up" evening, or make a "stir up" group with your neighbours. While the pud was steaming away I thought I'd make our ginger bread for this year. In our house we have a tradition of decorating gingerbread on Christmas eve. Its great fun and keeps the kids distracted from the coming excitement. Usually we buy our ginger bread, but i'm sure home made will be more yummy. Munchkin no. 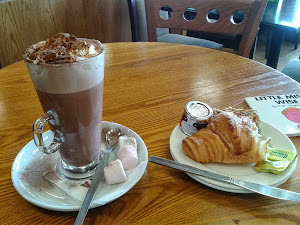 2 had great fun helping me out, and got rewarded with one of these for her efforts! We used this recipe: http://www.bbc.co.uk/food/recipes/gingerbread_men_99096. It made 35 men. The rest of them are in the freezer waiting to be decorated with icing and sweets! Oh i LOVE this time of year! On another note, presents wise, this year I am trying NOT to buy things from big on line super chains. Have you ever tried that? In an effort to support our local shops and retailers I have bought everything locally. It has taken me more time, but it has actually been more fun. I've chosen a different couple of shops each week and bought from them. I've been to 6 or 7 shops so far and come back with some lovely things i wouldn't have otherwise noticed by trawling the internet in the middle of the night. Also, i was surprised to find i got things cheaper in the shops than on line...sometimes half the price. Something i was not expecting. More Christmas updates soon. 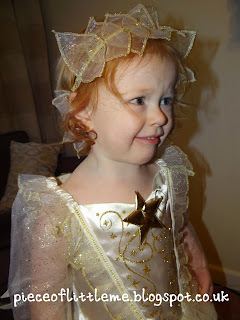 I'm linking up with Gina at Cold Tea: http://www.coldteaandsmellynappies.co.uk/ with this post. Happy Thursday everyone, i hope your week is going well. My daughter and i seem to be having a week full of play dates which is lovely...tomorrow i really must catch up on all those jobs! The other night i was tinkering away in the craft room, and came up with this! It was such a special time with my kids, writing to Father Christmas, so magical that i couldn't wait any longer to scrap it! no sketches or challenges used, just me , myself and my ideas. I really must write my Christmas list now, to include things like a hand held hoover for the car, a veg steamer for the kitchen, a mini sewing machine for my layouts or a new mixer for baking...all highly exciting...but would make my day lol! oh, plus the spa, Ferrari, cruise round the world...! what do you want for Christmas?!! Hello and welcome to my new members :o), I will pop over and see your space too, I love linking up with people! We love getting ready for Christmas in our house. It is almost more fun than the day itself. The anticipation, the yearly family traditions, the school nativity, and of course Father Christmas himself, HO HO HO! 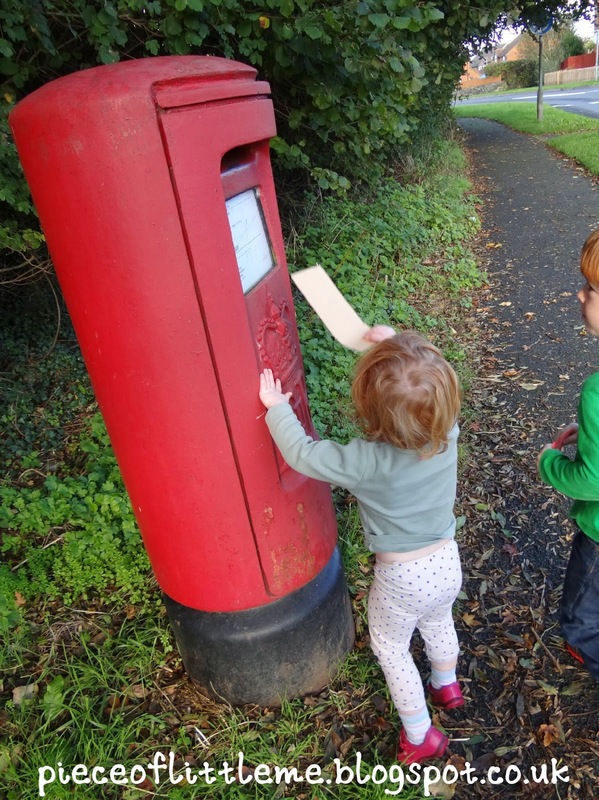 The munchkins have written their letters to Father Christmas...very important if we don't want them to change their minds on present ideas 3 days before the event. That did happen last year!! One wants pink peppa wellies, the other a pirate ship...can you guess which is which lol! This yr was the first year my son actually wrote his letter without any help, so cute, one for the scrapbook! ...(watch this space!). We posted our letters to the North Pole and believe they will have arrived by now for the elves to start making their toy. On a more crafty note, my son has finished his entry to the school "Christmas colouring competition"...no peeking! I will put up his marvellous pic (i'm not biased obviously) after the event. We have had our Christmas photo shoot, courtesy of moi, ready to go on the front of our Christmas Cards (watch this space). Can you guess what she is yet?! 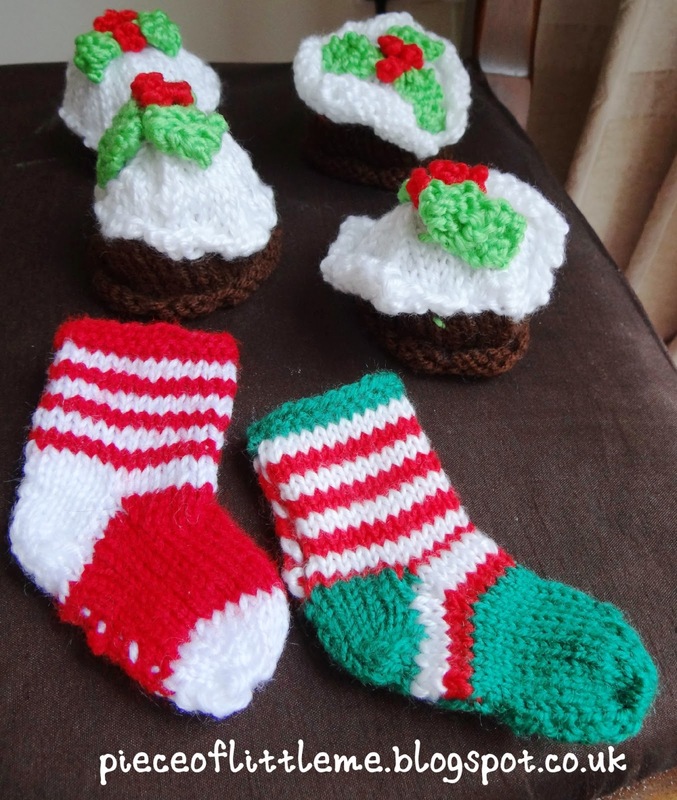 And ....I am also in the middle of knitting our Christmas decorations. Very thrifty of me I thought, coldteaandsmellynappies.co.uk would be impressed don't you think?! Next week is the Great British pudding bake off with my friends, when we'll make our own Christmas puds, yum! Well, how have you been getting ready for Christmas? Who had a great half term then? We did, and I didn't want it to end :o( !! We had just the right balance of catching up with jobs and having relaxing family time. 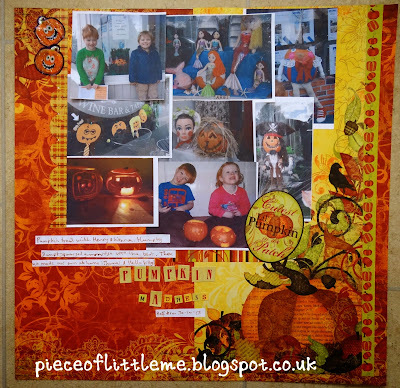 One of the fun things we did was a local pumpkin trail. We'd not been to one of these before. Most of the shops in the town had pumpkins in their windows and each had been given a name. The challenge was to find all the pumpkins, list the names and then enter a prize draw. It was really good fun, the weather was sunny and the kids were on top form. The pumpkins were so creative, from Harry Potter to Humpty Dumpty. I hope they do it again next year! 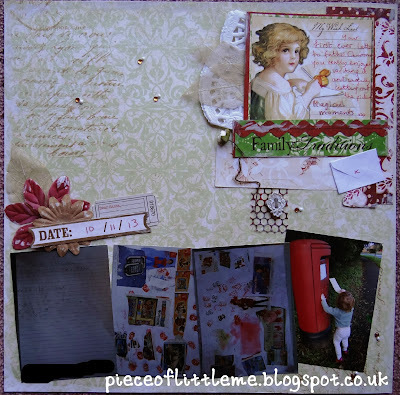 I am linking this layout up with http://www.lifepaperscrapbook.com/ as I used their fabulous sketch. Materials used: Bo Bunny Apple Cider collection and various stickers. Hope you had a great half term too. if you want to advertise on my blog please email me for details. if you want me or my munchkins to trial any of your products we would be happy to do so.